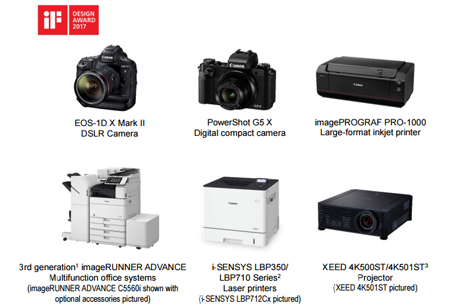 TOKYO, 9 February 2017 – Canon Inc. announced today that six Canon product designs were recognized by iF International Forum Design GmbH with prestigious 2017 iF Design Awards. Established in 1953, the iF Design Awards are recognized internationally as one of the most prestigious awards within the field of design, with outstanding industrial designs chosen from all over the world each year. This year 5,575 entries from 59 countries and regions were judged by internationally active design experts across seven disciplines: product, packaging, communication, service design, architecture, interior architecture and professional concept. This year marks Canon's 23rd consecutive year of winning iF Design Awards. Encouraged by the recognition of the Company’s design excellence, Canon will continue striving to realize products that combine the highest levels of performance and design. 1 3rd generation refers to any imageRUNNER ADVANCE-series models released in or after February 2016. 2 The i-SENSYS LBP350 series was launched in Asia as the imageCLASS LBP351x and LBP352x, and the i-SENSYS LBP710 series was launched in Asia as the imageCLASS LBP712Cx. 3 Sales of the XEED 4K500ST have ended. The XEED 4K501ST was launched in Japan as the Power Projector 4K501ST.